Laura Adams, born in Bryn Mawr, Pennsylvania, currently resides as a working artist in the Philadelphia area. 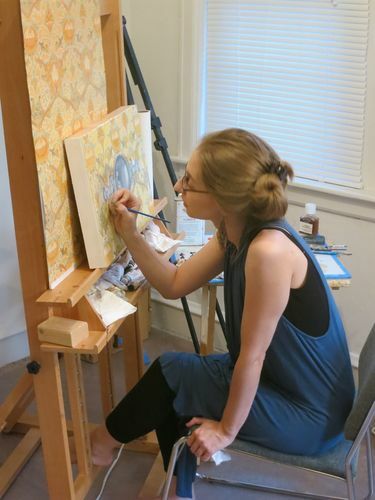 She received her Certificate in Painting from the Pennsylvania Academy of the Fine Arts in 2011 and her Bachelor of Fine Arts from the University of Pennsylvania in 2013. Laura had her first solo show at Artists’ House Gallery in Philadelphia in 2012, and she has participated in many group exhibitions both locally and nationally, at such esteemed venues as the Governor’s Residence in Harrisburg and the Pennsylvania Academy of the Fine Arts. She has also received a number of prestigious awards, such as the Richard C. Von Hess Memorial Scholarship and Travel Award and the Elizabeth Greenshields Foundation Grant. Her work resides in numerous public and private collections, most notably the Fellowship of the Pennsylvania Academy of the Fine Arts and the Pennsylvania Trust. She currently maintains a studio practice at her home in King of Prussia, Pennsylvania.